The 2014 Individual Award went to Christopher Owen Justice, Ph. D for outstanding contributions toward understanding the Earth by means of remote sensing. *John Faundeen for his leadership as Chair of the Data Preservation and Archiving Committee. *John Iiames for his work over the last 6 years as the Book Review Editor of PE&RS. *Alan Mikuni, Rebecca Morton and Pierre le Roux for spearheading the highly-successful ASPRS UAS Technical Demonstration and Symposium in Reno, Nevada, in October 2014. ASPRS offers many awards that are bestowed at the Spring Annual Conference. The awards are given to active ASPRS members and contributors to the field of spatial and image sciences. Click on one of the tabs below to learn more! LIfetime Achievement Award is the highest honor ASPRS bestows on any individual. The Lifetime Achievement award recipient shall be an individual who has rendered distinguished service to the Society and/or who has attained distinction in photogrammetry, remote sensing or the related sciences, deserving of recognition by the Society; and shall be elected for life. The total number of Lifetime Achievement Award recipients, however, shall not exceed twenty-five at any given time and no more than two shall be elected in any year. Lifetime Achievement recipients shall be entitled to all the privileges of the Society without payment of dues, but they shall not have the right to vote or hold office therein except when they have been elected from the Member or Emeritus Member classification. This award is not applied for but shall be conferred upon selected individuals by a two-thirds vote of all members of the Lifetime Achievement Award Committee by secret ballot at a duly advertised meeting, or by mail ballot. The designation of Fellow Member is the second highest honor ASPRS bestows on any individual. As outlined in the Society’s bylaws, a Fellow Member shall be an individual who is an active member of the Society and has performed exceptional service in advancing the science and use of the mapping sciences. Fellow Member status is awarded for professional excellence and for service to the Society. Nominees must have made outstanding contributions in a recognized Society specialization whether in practice, research, development, administration, or education in the mapping sciences. Nominees must be active members of the Society at the time of their nomination and must have been active members for the last ten consecutive years. Candidates are nominated by any active member of the Society, except members of the ASPRS Board of Directors, recommended to the Fellows Committee, which is a sub-committee of the Awards Committee, and elected by the ASPRS Board of Directors. Up to 0.3 percent of the Society’s active members may be elected as Fellows in any one year. Members of the ASPRS Board of Directors are ineligible for election. The Photogrammetric Award (Fairchild) is presented by ASPRS through the ASPRS Foundation, with the support of Lockheed Martin. The purpose of the Award is to stimulate the development of the art of aerial photogrammetry in the United States. The Award consists of a silver presentation plaque mounted on a walnut wood panel. Eligibility to receive the Award is restricted to current ASPRS members who have been members for at least three years prior to the date of selection as recipient. An outstanding invention or design involving any type of equipment that applies to the art of aerial photogrammetry. Any outstanding method developed for the use of aerial photographs and/or imagery. This does not relate only to the use of photographs for mapping but is intended in a general sense. Outstanding research for study along aerial photogrammetric lines. Outstanding effort for the general advancement of the art of photogrammetry. Any outstanding method developed for the use of photogrammetry, remote sensing or geographic information. The Award consists of a silver plaque and a cash award of $5,500. 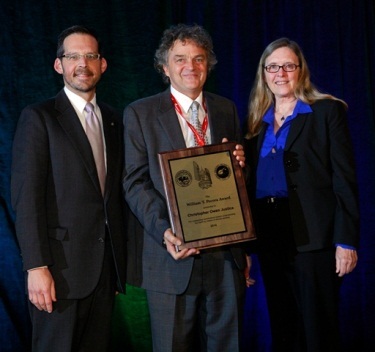 The presentation of the Award will take place during the annual (spring) ASPRS Conference. The Award is for an individual or team of developers responsible for the innovation. However, the award is not made to the companies, agencies, bureaus, or associations for whom they work. The Award Selection Committee representing the commercial, academic, and government sectors of the ASPRS membership convenes annually to nominate and to review candidates for the Award. Nominations must show specific breakthrough research or technology that enabled significant advances in the practice and applications of photogrammetry, remote sensing or geographic information systems. The Selection Committee rates nominations for overall effectiveness, economic and scientific impact, innovativeness and extensiveness of use. Get Ready! Prepare to apply for one or more ASPRS scholarships beginning September 1. Read the instructions below to apply and begin preparing your application and contacting prospective recommenders. ASPRS is pleased to offer nine scholarship awards totaling more than $30,000 in value! Available to both undergraduate and graduate student members of ASPRS, these resources have been generated with the intention of advancing academic and professional goals in the geospatial sciences. ASPRS recognizes that students are the future of these rapidly evolving fields and encourages all who are qualified to take advantage of these unique opportunities. PLEASE NOTE: THE ASPRS WEBSITE HAS CREATED A NEW SCHOLARSHIP APPLICATION SYSTEM THAT REQUIRES ASPRS STUDENT MEMBERS TO FIRST LOG IN IN ORDER TO APPLY. DUE TO SOME MAINTENANCE ON THE LOGIN, SOME USERS ARE NOT ABLE TO ACCESS THE APPLICATION. BECAUSE OF THIS TECHNICAL ISSUE, STUDENTS ARE INVITED TO USE A ‘BACKUP FORM’. ALL STUDENTS ARE GIVEN AN EXTRA FEW DAYS–UNTIL OCT 29 TO COMPLETE THE APPLICATION. You must login here below first . Please note that all applications must be submitted in electronic format. Submit the application form and all supporting materials or documents using the online application. Letters of reference are sent via a separate google application similar to last year. This is to allow reviewers who are not ASPRS members to submit recommendations. Scan a copy of a recent transcript or print to PDF your unofficial transcript from your university. Upload the transcript as a file when prompted in the scholarship application. the translating agency to ASPRS HQ. format or submit an abstract and article highlights. for information about the benefits of ASPRS membership. Delays In Cyber Space Will Not Be Considered. year. Any application that does not comply in its entirety with the terms stated above and/or with the terms of the specific award(s) applied for will be ineligible. The purpose of the award is to encourage upper-division undergraduate and graduate-level college students to pursue a course of study in surveying and photogrammetry leading to a career in the geospatial mapping profession. Students currently enrolled or intending to enroll in a college or university in the United States or Canada, who are pursing a program of study in surveying or photogrammetry leading to a career in the geospatial mapping profession. The award consists of a certificate and a check in the amount of $7,000 and a one-year student or associate membership (new or renewal) in ASPRS. This award is presented by ASPRS through the ASPRS Foundation from funds donated by students, associates, colleagues, and friends of Frank Moffitt as a memorial to his lifetime contributions to the photogrammetric surveying profession. A listing of courses taken, and/or those to be taken, in surveying and photogrammetry and other related geospatial information technologies, recognizing that instruction in remote sensing is often embedded in courses taught in many different disciplines. A transcript of all college/university level courses completed and grades received to demonstrate scholastic ability. A listing of: 1) work experience and internships; 2) technical papers, research reports or other publications; 3) courses taught as a lecturer or teaching assistant; and 4) presentations made that may support the applicant’s capabilities in this field. Two letters of recommendation from faculty members or professionals having knowledge of the applicant’s capabilities (demonstrated or potential). A statement, not to exceed 2 pages, detailing: 1) the applicant’s educational and/or research goals that relate to the advancement of surveying and photogrammetry and other related geospatial information technologies and the applications of these technologies and 2) the applicant’s long-term professional career goals. The Committee evaluates each candidate’s application, applying equal weight to each element outlined above. The Committee will also assign additional points, as appropriate, to the final scores for those applicants having attributes that reflect Professor Moffitt’s career and contributions. To facilitate graduate-level studies and career goals directed towards new and innovative uses of remote sensing data/techniques that relate to the natural, cultural, or agricultural resources of the Earth. Current or prospective graduate student members of ASPRS. One year scholarship of $2,000 and a certificate. This award is presented by ASPRS with funding provided by a grant from the ASPRS Foundation, on behalf of individual and corporate contributions to the Foundation in memory of William A. Fischer, a pioneer in the use of remote sensing from space for the study of the planet Earth. A 2-page statement detailing applicant’s educational and career plans for continuing studies in remote sensing applications. Note: Submission of technical papers, research reports, or other pertinent items indicating applicant’s capabilities is encouraged but not required. Each item above will carry equal weight in the committee’s consideration. The applicant who, in the opinion of the majority of the committee, has the highest overall ranking will be designated as the recipient. The purpose of the Award is to encourage and commend college/university graduate students at the PhD level who display exceptional interest, desire, ability, and aptitude in the field of remote sensing or other related geospatial information technologies, and who have a special interest in developing practical uses of these technologies. The Award is made to a graduate student (PhD level) currently enrolled or intending to enroll in a college or university in the United States or Canada who is pursuing a program of study aimed at starting a professional career where expertise is required in remote sensing or other related geospatial information technologies. The award consists of a certificate and a check in the amount of $6,500 and a one-year student or associate membership (new or renewal) in ASPRS. The award is presented by the ASPRS Foundation from funds donated by students, associates, colleagues, and friends of Robert Colwell, one of the world’s most respected leaders in remote sensing, a field that he stewarded from the interpretation of World War II aerial photographs to the advanced acquisition and analysis of many types of geospatial data from military and civilian satellite programs. A listing of courses taken, and/or those to be taken, in remote sensing or other related geospatial information technologies, recognizing that instruction in remote sensing is often embedded in courses taught in many different disciplines. An official transcript of all college/university level courses completed and grades received to demonstrate scholastic ability. A listing of internships, special projects or work experience; technical papers, research reports or other documents; courses taught as a lecturer or teaching assistant; and presentations made that may support the applicant’s capabilities in this field. The Selection Committee evaluates each applicant, applying equal weight to each of the five items listed above. The applicant who, in the opinion of the majority of the Committee, has the highest overall ranking is designated as the winner. The purpose of the award is to encourage those who have an exceptional interest in pursuing scientific research or education in geospatial science or technology or land information systems/records to enter a professional field where they can use the knowledge of this discipline to excel in their profession. The Scholarship is made to an under-graduate student currently enrolled or intending to enroll in a college or university in the United States for the purpose of pursuing a program of study that prepares him/her to enter a profession in which education in geospatial science or land information disciplines will advance the value of those disciplines within that profession. The award consists of a certificate and a check in the amount of $2,000 and a one year student membership (new or renewal) in the Society. A listing of courses taken in land information, data management and geospatial information and technology and the academic grades received. A transcript of all college or university level courses completed and grades received to demonstrate scholastic ability. If the applicant is a prospective enrollee in a college or university program, prior high school and post high school transcripts are required. Two letters of recommendation from faculty members or professionals having knowledge of the applicant’s capabilities (demonstrated or potential) as a professional in a field that uses land information. Papers, research reports, or other items produced by the applicant that may support the capabilities in this field. A statement of work experience that may include internships, other forms of work experience, or special projects that demonstrates excellence in geospatial science, technology, land information systems/records research, and/or in communications and collaboration. The statement should include the nature, location and date(s) of the experience. A statement, not to exceed 2 pages, detailing the applicant’s plans for continuing studies towards becoming a professional in a field that uses land and/or geospatial information as a key part of its performance. The Committee evaluates each application, applying equal weight to each of the items listed above. The applicant who, in the opinion of the majority of the Committee, has the highest overall ranking is designated as the winner. 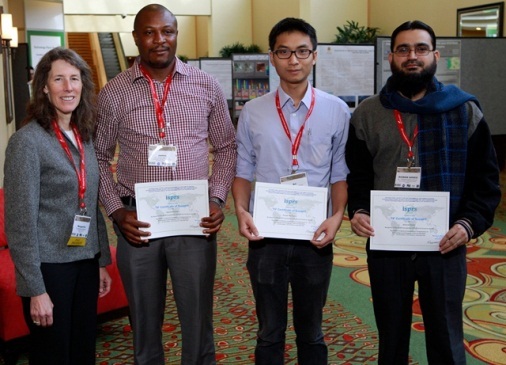 To facilitate research-related travel by outstanding graduate students in remote sensing. Such travel includes field investigations, agency visits, participation in conferences, or any travel that enhances or facilitates a graduate research program. Graduate Student members of ASPRS. A grant of $2,000 and a hand-engrossed certificate. This award is presented by ASPRS, with funding provided by a grant from the ASPRS Foundation on behalf of individual and corporate contributions to the Foundation in memory of Ta Liang, a skilled civil engineer, an excellent teacher, and one of the world’s foremost air-photo interpreters. An official transcript of all college-level courses completed and grades received, class rank, and, if available, scores on the Graduate Record Examination, to demonstrate scholastic ability. A description of the applicant’s extracurricular activities, particularly as they relate to community service. The purpose of this award is to encourage students who have an exceptional interest in pursuing scientific research or education in geospatial science or technology related to photogrammetry, remote sensing, surveying and mapping to enter a professional field where they can use the knowledge of their discipline to excel in their profession. The award is made to an undergraduate student currently enrolled or intending to enroll in a college or university in the United States for the purpose of pursuing a program of study to enter a profession in which education in photogrammetry, remote sensing, surveying and mapping and geospatial science or technology disciplines will advance the value of those disciplines within that profession. The award consists of a certificate, a check in the amount of $2,000 and a one-year student membership (new or renewal) in the society. This award is presented by the ASPRS Foundation from funds donated by the Anson bequest and contributions from the Society and the Potomac Region as a tribute to Abe Anson’s many contributions to the field of photogrammetry, remote sensing, and long, dedicated service to the Society. A listing of courses taken, and/or to be taken in photogrammetry, remote sensing, surveying and mapping, data management, and geospatial science or technology disciplines recognizing that instruction in remote sensing and geo sciences is often taught in many disciplines. An official transcript of all college or university level courses completed and grades received to demonstrate scholastic ability. If the applicant is a prospective enrollee in a college or university program, prior high school and post high school transcripts are required. Two letters of recommendation from faculty members or professionals having knowledge of the applicant’s capabilities (demonstrated or potential) as a professional in a field that uses geospatial information. A statement of work experience and listings that may include internships, other forms of work experience, special projects, papers, research reports, courses taught as a teaching assistant or other items produced by the applicant that may support the capabilities in this field. The statement should include the nature, location and date(s) of the experience. A statement, not to exceed 2 pages, detailing the applicant’s plans for continuing studies towards becoming a professional in a field that uses photogrammetry, remote sensing, surveying and mapping, land and/or geospatial information science or technology as a key part of its performance. To encourage and commend college students who display exceptional interest and ability in the theoretical aspects of photogrammetry. Cash prize of $2,000 and a certificate. The award is administered by the ASPRS Foundation from funds provided by the estate of Mrs. Helen Altenhofen as a memorial to her husband, Robert E. Altenhofen. A past president of ASPRS, Mr. Robert Altenhofen was an outstanding practitioner of photogrammetry and made notable contributions to the mathematical aspects of the science. A 2-page statement by the applicant regarding plans for continuing studies in theoretical photogrammetry. Papers, research reports, or other items produced by the applicant that indicate capability in these fields. Official Academic transcripts– including a separate list of relevant courses taken with grades received. The applicant who, in the opinion of the majority of the committee, has the highest overall ranking will be designated the recipient. The purpose of the Award is to encourage and commend college students who display exceptional interest, desire, ability, and aptitude to enter the profession of teaching Surveying, Mapping, or Photogrammetry. 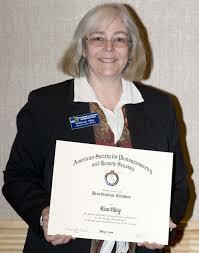 The Award is made to a graduate student member of ASPRS currently enrolled or intending to enroll in a college or university in the United States, who is pursuing a program of study in preparation for entering the teaching profession in the general area of Surveying, Mapping, or Photogrammetry. The award consists of a certificate and a check in the amount of $3,500. This Award is administered by the ASPRS Foundation from funds donated by the friends and colleagues of Paul R. Wolf as a memorial to him. Recognized nationally and internationally, Paul was an outstanding educator and practitioner of Surveying, Mapping, and Photogrammetry and a great friend of the Society. As author, teacher, and mentor, Paul made significant educational and academic contributions to these fields. A listing of courses taken in Surveying, Mapping, and Photogrammetry and the academic grades received. An official transcript of all college or university level courses completed and grades received to demonstrate scholastic ability. Two letters of recommendation from faculty members having knowledge of the applicant’s capabilities (demonstrated or potential) as an educator in this field. A statement of teaching experience that may include teaching assistantships, seminars, and formal course teaching. The statement should include the nature, location and date(s) of the experience. A statement, not to exceed 2 pages detailing the applicant’s plans for continuing studies towards becoming an education professional in Surveying, Mapping, or Photogrammetry. The purpose of the Scholarship is to encourage and commend college students who display exceptional interest, desire, ability, and aptitude to enter the profession of surveying, mapping, photogrammetry, or geospatial information and technology. In addition, the Scholarship recognizes students who excel at an aspect of the profession that Ken Osborn demonstrated so very well, that of communications and collaboration. The Scholarship is made to an undergraduate student currently enrolled or intending to enroll in a college or university in the United States, who is pursuing a program of study in preparation for entering the profession in the general area of surveying, mapping, photogrammetry, or geospatial information and technology. This annual Scholarship consists of a certificate and a check in the amount of $2,000 and a one year student membership (new or renewal) in the Society. This award is presented by the ASPRS Foundation, with funding provided by donations from friends and colleagues of Kenneth Osborn as a tribute to him. A listing of courses taken in surveying, mapping, photogrammetry, and geospatial information and technology and the academic grades received. Two letters of recommendation from faculty members or professionals having knowledge of the applicant’s capabilities (demonstrated or potential) as a professional in this field. A statement of work experience that may include internships, other forms of work experience, or special projects that demonstrate excellence in these fields and in communications and collaboration. The statement should include the nature, location and date(s) of the experience. A statement, not to exceed 2 pages, detailing the applicant’s plans for continuing studies towards becoming a professional in surveying, mapping, photogrammetry, or geospatial information and technology. The purpose of the IELA is to improve the quantity and quality of literature in the recipient’s library that deals with the mapping sciences (i.e., photogrammetry, remote sensing, GIS, and related disciplines). It is administered by the ASPRS Foundation. The IELA is made to a university or educational institution outside the USA and typically in the developing world. One free registration to the conference where the award is to be presented for a member of the institution to whom the award is given.The total value of this award is over $1,500. The materials are to be placed in the libraries of the institutions receiving the award.The IELA award has been augmented by a generous grant from the Environmental Systems Research Institute (ESRI) of the complete ESRI Press Library collection, and selected titles from the John Wiley and Sons, Publishers, catalog. Application is by Special Application Form (PDF) . The IELA selection committee will evaluate each application. The applicant who, in the opinion of the majority of the committee, has the highest overall ranking will be designated as the recipient. The recipient institution must place the publications and materials in their institutional library and make them available to students and researchers without limitation. Any institution that receives the award is ineligible to apply for the award again for a period of five years. This Award is presented by ASPRS with funding provided by the ASPRS Foundation through unrestricted donations. First prize: An engraved pewter tankard, a certificate, and $500. Second prize: A certificate and $300. Third prize: A certificate and $200. Eligibility to receive the Award shall not be restricted to members of ASPRS and is intended for those who qualify under the selection criteria. No application is required since the nominees are determined by an award selection committee. The Award is made to the author, or collaborating authors, (provided each played a major role in the publication) who, in the opinion of the majority of the award selection committee, best meets the criteria established. The Award is not made to companies, agencies, bureaus, schools, or associations. However, their personnel are eligible to receive the Award. 1. A case of practical application or adaptation, where an exceptional degree of technical skill, judgment, or initiative is demonstrated, or where a significant increase in operating efficiency or productivity is achieved. 2. The development of a new and valuable technique or method. 3. An outstanding design or invention of equipment or material, or a new or unusual application of existing equipment or material. The Award is normally made to individuals whose article was published in ASPRS journal during the calendar year preceding the year of the Award presentation. This Award is presented by ASPRS through the ASPRS Foundation, with funding provided by ERDAS, Inc. and is intended to encourage and commend those who publish papers of scientific merit in the advancement of knowledge about remote sensing technology. Eligibility to receive the Award is not restricted to members of ASPRS and is intended for those who qualify under the selection criteria of this Deed. The Award is made to an individual or two or more collaborating individuals who, in the opinion of the award selection committee, best meets the criteria established. No application is required since the nominees are determined by the selection committee. The development of a new and valuable technique, method, or application. A case of such a development where an exceptional degree of technical skill, judgment, or initiative is demonstrated. An outstanding design or invention of equipment or material, or a new or unusual application of existing equipment or software is achieved. This award is presented by ASPRS through the ASPRS Foundation, with funding provided by a grant from the Environmental Systems Research Institute (ESRI). First prize: A certificate and $1,000. Second prize: A certificate and $600. Third prize: A certificate and $400. Eligibility to receive the award is not restricted to ASPRS members; the award is made to the individual, or collaborating individuals who, in the opinion of the award selection committee, best meets the established criteria. No application is required since the nominees are determined by the selection committee. The Award is normally made to individuals whose article was published in the ASPRS journal, PE&RS, during the calendar year preceding the year of the Award presentation. All articles are eligible for consideration including Highlight and Feature articles. This Award is presented by the ASPRS Foundation on behalf of Mr. Talbert Abrams, a distinguished charter member of ASPRS. A Grand Award which includes a presentation plaque with the name of the recipient permanently affixed to it and $3,000. First and second honorable mention. These two awards include a certificate [one each] to those authors who were given second and third place honors by the selection committee. If an award goes to a single-authored paper, the author must be a member of ASPRS who has been a member in good standing for at least one year prior to the date of selection as recipient of the Award. If a multiple-authored paper is selected for any of the awards, at least one author must have been a member in good standing of ASPRS for at least one year prior to the date of selection as recipient of the Award. If a multiple-authored paper is selected for any of the Awards, the senior author is presented the award plaque. The other recipients will receive certificates. No application is required since the nominees are determined by an award selection committee. The committee will evaluate each author-nominee for their article that appeared in PE&RS during the 12-month period ending with, and including, the November issue of the year prior to the year of the annual meeting of ASPRS. The committee will determine the publication having the greatest merit by any or all of the recognized standards of originality, practical and theoretical value, clarity of exposition, and general interest. First awarded in 1968, the Region of the Year Award recognizes excellence at the regional level in providing service to members and to the profession at large. The winning Region receives a hand-engrossed certificate and possession of the Region of the Year Banner for one year. 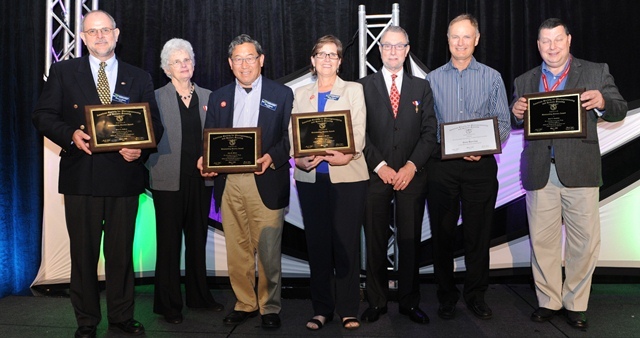 First awarded in 1980, the Region Newsletter of the Year Award recognizes excellence at the regional level in providing service to members and to the profession at large through publication of a newsletter. The winning Region receives a hand-engrossed certificate. First awarded in 2003, the Region Website of the Year Award recognizes excellence among the regions in providing service to members and to the profession at large through website publication. Selection is made by the ASPRS Region Website Selection Committee using a scoring and weighting system to decide the winners. The winning website(s) demonstrate high-quality look and feel in the site design and effectively convey accurate, informative and timely content. Each site is easy to navigate with few or no broken links and page file sizes are minimized to reduce page loading times. The sites display content of unique regional flavor and are in compliance with the Americans with Disabilities Act (ADA).